Friday, our friends Sean and Lindsay invited us to go see “Bengal Tiger at the Baghdad Zoo” at the Mark Taper Forum. We don’t go to the theater much, so were excited to go out and see and do something new. The critically acclaimed play (it’s up for a Pulitzer) centers around two soldiers, a tiger and an Iraqi translator in Baghdad during the Iraq War, and the characters are all dealing with their own existential crises and ghosts. 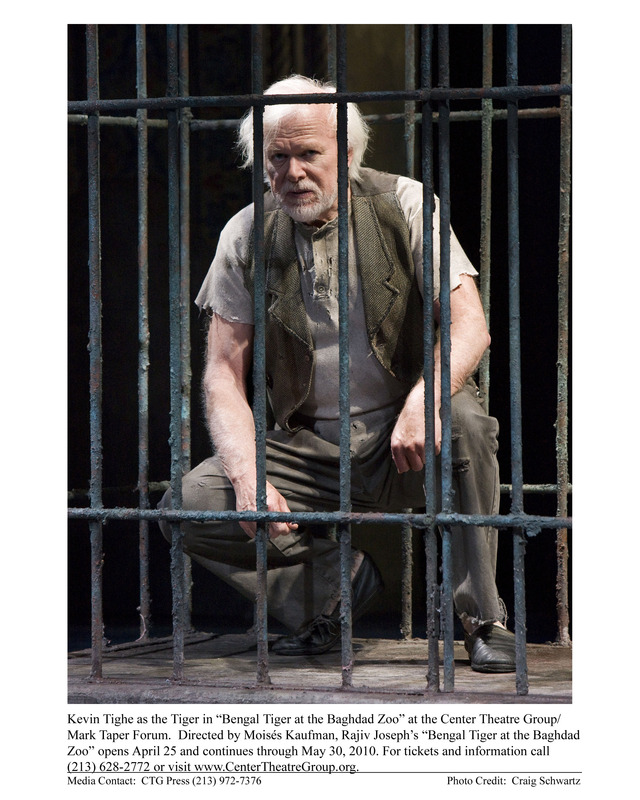 The tiger, played by Kevin Tighe wearing raggedy clothes is the first indication that this play will be something different. In the first scene, he paces in his cage, ranting about life in the zoo and during war-time, dropping profanities left and right. Things quickly take a turn for the worst when one of the soldiers guarding the tiger taunts him with food and the tiger bites off his hand. As the characters try to accept their fates and deal with their emotional traumas, the play manages to be simultaneously funny and painful, giving a glimpse into the tragic absurdities of war and the stressors that cause people to act out or go mad. “Bengal Tiger at the Baghdad Zoo” is engaging throughout, it feels fresh and original and it’s deeply affecting. Its simple set is also very impressive, using some ingenious lighting techniques to use turn one static backdrop into an office, a zoo, a garden, the desert, the night sky, a hospital and more. I went into the play with no information as to what it’s about, so I don’t want to say too much, but “Bengal Tiger at the Baghdad Zoo” is at the Mark Taper Forum until May 30, and it’s definitely worth checking out. Watch videos, learn more and buy tickets.